The Two Stage Emergency THC/Marijuana Detox Kit for People Over 200 pounds contains one bottle of QCarbo Plus with Super Boost Tabs, one bottle of QPretox Daily Supplements, and one home test device. A special blend of vitamins, minerals, and botanicals provide exactly what you need to pass a urine drug screen on short notice. 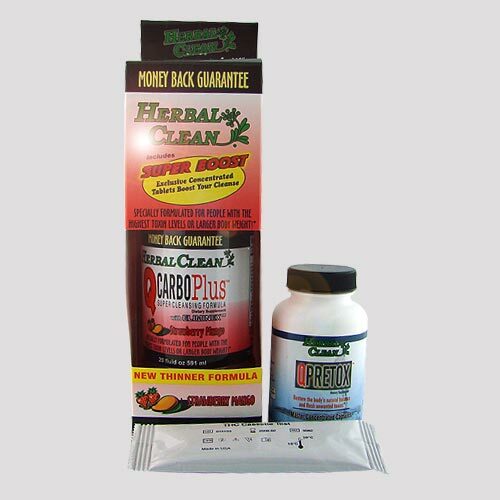 Perfect for the habitual or over weight recreational users, the Two Stage Emergency Detox Kit for People Over 200 pounds is a potent and reliable solution. Be ready to start using the QPretox Capsules as soon as you recieve your detox kit. The QCarbo beverage should be used approximately 2 hours before test time. On test day Drink 20 ounces of water 2 hours prior to submitting a test sample. Wait 20 minutes and drink the entire bottle of QCarbo Plus with all 4 Super Boost tabs. Wait 20 more minutes and drink an additional 20 ounces of water. Urinate 2 times and then use the home test device. Once verifying that results are negative for drug metabolites (passing, 2 lines) proceed to your test immediately.